﻿ Irish Film Institute -Win a fantastic Mood Indigo prize bundle! Win a fantastic Mood Indigo prize bundle! To celebrate the opening of Michel Gondry’s new film Mood Indigo, we have a copy of the cult novel by Boris Vian to give away along with a pair of tickets to any screening of the movie this August*. 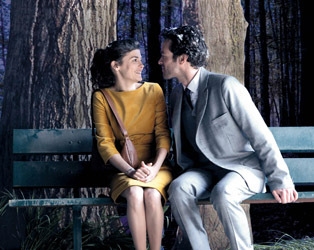 An adaptation of the 1947 novel Froth on the Daydream written by the remarkable polymath Boris Vian, Michel Gondry’s Mood Indigo is a characteristically tender story of devotion and despair. Meeting at a lavish party where they instantly hit it off, Romain Duris’ Colin and Audrey Tautou’s Chloé are soon inseparable and, following an idyllic courtship and fairly shambolic wedding proposal at an ice rink, are then married. However, what seems like the couple’s happy ending soon fades away as Chloé becomes ill on their honeymoon and Colin desperately struggles to provide her with relief, a source of expense which bankrupts the once wealthy and ebullient couple. This film opens at the IFI on Friday, August 1st. Tickets are on sale now. BOOK HERE. What other film did Michel Gondry direct that starred Kate Winslet? Competition closes at midnight, Thursday July 31st, 2014. The winner will be contacted by email shortly after. *Tickets to the film screening are subject to availability.